Bury boss David Flitcroft apologised to their supporters for their performance in the 6-0 loss at Coventry. The Shakers were 3-0 down within 16 minutes at the Ricoh Arena and conceded a fourth before half-time. 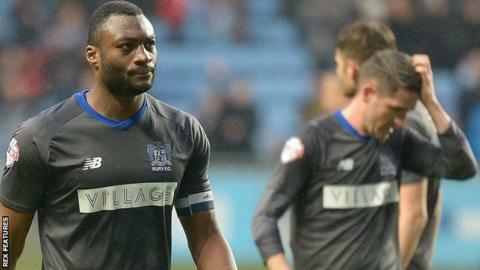 Defeat means Bury have taken just four points from their last eight games in League One. "The first thing is to apologise for the performance and the unacceptable way we've conceded," Flitcroft told BBC Radio Manchester. "The way we represented here today is not the way I want my Bury team to represent the supporters, the board and the football club. "We've got to take that responsibility as a group, we've got to take that on and understand that it won't, and can't, happen again. "It's not a disappointment it's a feeling of emptiness inside that I've got and I'll come out fighting." Although the January transfer window has closed, the loan window is now open and Flitcroft is hoping to add new recruits. "If I get an opportunity to bring in a couple of players then I think that's what the squad needs," he added. "We've been working hard on that now the window's open and we're going to have to really try and drive that forward as we look very vulnerable at the back."